In theory, Tai Chi can help prevent back pain or lessen existing pain, though it has not yet been proven. The movements practiced in Tai Chi train the body to avoid slouching and rounding shoulders, resulting in better posture. Proper posture decreases the amount of stress on the spine and helps to prevent back pain. Many Tai Chi movements focus on balance and the perception of movement. Having a heightened sense of body awareness can help to prevent accidents that could result in back pain. It also reduces further aggravation of existing back pain caused by unnatural movement of the body. Like most forms of exercise, Tai Chi helps to tone and strengthen muscles. The bodyweight exercises actually help to promote bone growth, along with strengthening the muscles surrounding the spine, including the abdominal muscles and hamstrings. Strengthening of the muscles surrounding the spine primarily occurs through movements that use the spine as a pivot. Tai Chi helps to focus both the mind and body to prevent back pain. Deep, focused breathing with movement creates a meditative state. Such meditative states have been proven to reduce stress which can aggravate or cause back pain. 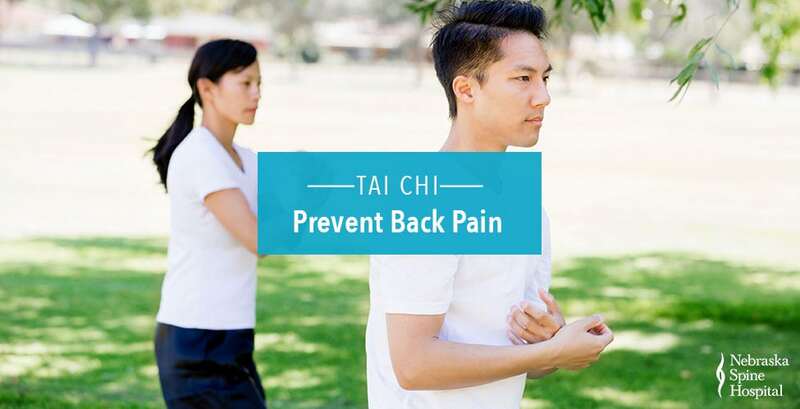 Many elements of Tai Chi come together to help prevent back pain. If you’re looking to begin exercising or simply want a change from your current program, Tai Chi may be a good fit. As always, please consult your physician before beginning a new exercise program.